2016 Year Ender Special: Top 10 Bollywood Films Of The Year That Have Left Immense Mark On The Audience! It’s that time of the year again when we queue up most popular and hit Bollywood films of this year. This year, many films failed to show their magic at the Box Office while many turned out to be excellent in terms of Box Office collections and content. Overall 2016 year got some amazing films like Udta Punjab, Dear Zindagi, Sultan, Dangal and many more, which have been applauded by audiences. In fact, there are many such movies this year which have left the critics stupefied. 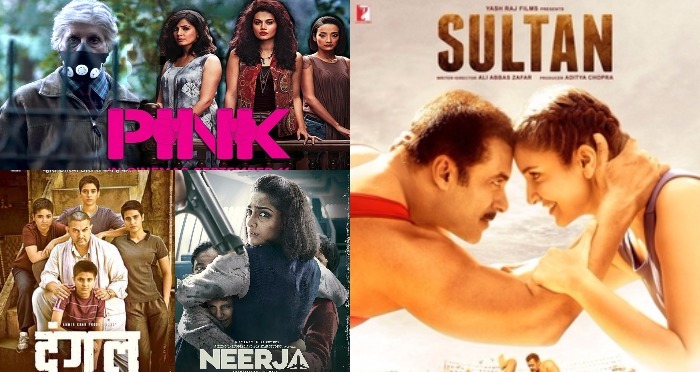 As far as Bollywood is concerned, 2016 can be considered an above-average year as the filmmakers have put their step forward to not follow the norm and given the audience that they deserve to watch on the big screens. Well, ending the year on a good, let’s take a look at the list of top 10 Bollywood films that have managed to win everyone’s heart. 1. Sultan: Salman Khan and Anushka Sharma starrer Sultan, which was directed by Ali Abbas Zafar, received an immense response not only in India but across the border. The film not only earned well in the domestic market but also made amazing numbers overseas as well. Salman Khan’s incredible screen presence, Anushka Sharma’s Haryanvi accent and the athletic locks and grips as a wrestler were commendable. Sultan is termed as one of the best films of Salman Khan’s career and has left ever-longing affect on the audience as well. 2. Dangal: It would be the biggest mistake and a sin if Aamir Khan’s Dangal will not be on the list of top movies of this year. The film is clearly the winner of 2016 and has touched the nation’s soul with an amazing storyline. Every character of the film has received an immense response and has certainly proved that ‘Is Desh Ki Choriyaan, Chore se Kam nahi hai’. Besides winning the hearts of the audience, Dangal is minting record breaking collection at the Box Office. 3. PINK: One can’t stop talking about the director Shoojjit Sircar, who has given such an amazing film to the industry and audience. Amitabh Bachchan starrer PINK is one such film that has changed the mindset of the majority of the people in the country. The film can be termed as one of the most acclaimed courtroom drama of Bollywood. 4. M.S Dhoni – The Untold Story: Bollywood actor Sushant Singh Rajput has proved to be the best actor of the industry and also proved that he was the right choice to be cast as Captain Cool Dhoni in ‘M.S. Dhoni: The Untold Story’. The film has turned out to be the masterpiece by director Neeraj Pandey and has been declared as one of the celebrated biopics of 2016. 5. Neerja: With Neerja, Sonam Kapoor has proved that she is excellent as an actor and has not mastered only to be the fashionista. Sonam’s performance in the film was really incredible that allowed audience to connect with the bravery of real Neeraj, who had received youngest recipient of India’s highest peacetime award for bravery. Moreover, applauds go to photographer turned director Atul Kasbekar, who has hit the six with his debut film. 6. Udta Punjab: The fight for the film’s release was quite real and a big struggle! Well, all’s well that ends well as Udta Punjab won rave reviews from critics as well as from the audience. Directed by Abhishek Chaubey, the incredible performances by Shahid Kapoor and Alia Bhatt had won the hearts of the masses. 7. Dear Zindagi: Shah Rukh Khan and Alia Bhatt starrer Dear Zindagi is one of the beautiful movies of this year. Through their eyes, SRK and Alia taught us how it can be easy to deal with the life, relationships, and the issues that bog them down. Thanks, Kaira and Jug for teaching us to live carefree and happy-go-lucky life always. 8. Airlift: Akshay Kumar can never leave us disappointed with patriotic films and this year, the actor gave us an amazing film Airlift, directed by Raja Krishna Menon. The film is based on the true story of how Indians were evacuated from Kuwait after the Iraqi invasion in 1990. Usually, many directors pitfall when they work with real-life stories but Airlift has proved it wrong. It’s the great film of this year that one can keep watching ahead. 9. Ae Dil Hai Mushkil: Directed by Karan Johar, Ae Dil Hai Mushkil starring Ranbir Kapoor, Anushka Sharma, Aishwarya Rai Bachchan and Fawad Khan, showcased a wonderful love triangle love story. An emotionally floundering Ranbir and Anushka in Ae Dil Hai Mushkil have got a real meaning of true friendship and love. 10. Sarbjit: The performances of Aishwarya Rai Bachchan and Randeep Hooda had left audience stunned. Directed by Omung Kumar, Sarbjit, which is based on the tragic story of Sarbjit Singh, was the film that needed to be told out on the big screen. Read: 2016 Year Ender Special: Top 10 Viral Bollywood Photos That Broke The Internet! Previous : Video: SRK in ‘Raees’ Style Sent Out This Thoughtful Message To Us For New Year’s Eve! Next : Lisa Haydon Announces Her Pregnancy With This Adorable Photo of Baby Bump!